When the man who made La Gloria Cubana a household name started his new family-run company in 2009, few in the cigar industry doubted he would be successful in his new venture. To date, by seemingly every measure, he has been. “The Short Run 2016 takes a new direction and departs from our prior approach, since it is only one vitola,” reads a letter from the E.P. Carrillo team that accompanied my samples. 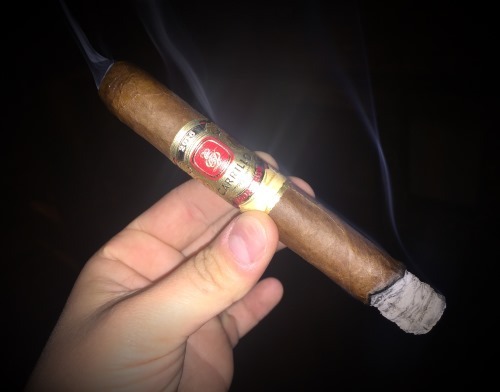 “It is adorned with a beautiful honey Colorado wrapper from Ecuador that is smooth to the touch and alluring to the eye and utilizing unique tobacco from several regions in Nicaragua for the binder and filler.” Only 2,500 boxes of 10 cigars were made, with each cigar carrying an MSRP of $12. The toro-sized smoke (6 x 52) is oily and light brown in color with minimal veins and potent pre-light notes of sweet hay and light syrup. Moderately firm to the touch, the well-constructed cap clips easily to reveal a smooth cold draw with a slight spice on the lips. Notably, the large, ornate band of gold and red is the most detailed, regal, and textured band to adorn an E.P. Carrillo cigar since the company’s inception—which may signal how Ernesto Perez-Carrillo feels about this particular release. Once lit, the initial profile is characterized by a hearty dose of roasted nuts, spicy cedar, and graham cracker. Well-balanced with a creamy texture, it’s the kind of flavor the makes your mouth water significantly between puffs—and the sweet, abundant resting smoke doesn’t hamper my enjoyment either. As it progresses, this medium-bodied treasure loses some of the cedar bite in favor of more graham and creamy nut. Oak, hay, and restrained leather add more balance without overpowering the core tastes. All the while the physical properties are excellent from light to nub. The gray ash holds well off the foot, the draw is easy, the burn line straight, and the smoke production is well above average. If I were asked what flavors I most enjoy in a cigar, sweet cream, graham cracker, and roasted nuts would rank among my top tastes. The E.P. Carrillo Short Run 2016 has all three in spades. This cigar wasn’t blended specifically for my palate, but it might as well have been. Exquisite in every way while maintaining incredible balance and offering rare subtlety, I have no reservations about awarding this triumph a rare rating of five stogies out of five. I’ve had some excellent EPC smokes in the past. This one sounds right up my alley. I’ll be on the lookout for this! I’ve been a fan of E.P. Carrillo’s work for sometime, I can’t say enough good things about how much I’ve enjoyed the results of his work! Till this day he is one of my favorite blenders. Glad to know you enjoyed it, great review! Looking forward to getting my hands on a box! Where can you find these? I’ve looked online and can only find the 2015s.